Location of Boca Raton in Palm Beach County, Florida. Boca Raton is a city located in Palm Beach County, Florida and was incorporated in May of 1925. As of the 2000 census, the incorporated area had a total population of 74,764, the 2004 population recorded by the U.S. Census Bureau is 78,069.. It is the largest city between West Palm Beach and Pompano Beach. However, on November 2, 2004, the voters of the Via Verde Association and the residents of the Waterside community approved annexation into the incorporated area of Boca Raton, increasing the city population to 83,960 and land area to a total of 29.6 square miles. 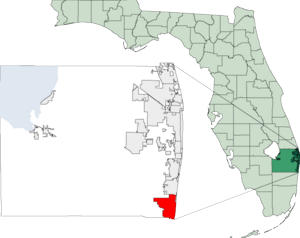 Boca Raton is located at 26°22′N 80°6′W (26.37, -80.10).GR1 Boca Raton is the second most populous and southernmost city in Palm Beach County. It is located on the East coast of Florida between Delray Beach to the north and Deerfield Beach, in Broward County, to the south. According to the United States Census Bureau, the city has a total area of 75.4 km² (29.1 mi²). 70.4 km² (27.2 mi²) of it is land and 5.0 km² (1.9 mi²) of it is water. The total area is 6.63% water. Substantial parts of metropolitan Boca Raton including most areas west of Interstate 95, are actually the unincorporated parts of Boca Raton. As of the censusGR2 of 2000, there were 74,764 people, 31,848 households, and 20,000 families residing in the city. The population density was 1,061.7/km² (2,749.8/mi²). There were 37,547 housing units at an average density of 533.2/km² (1,381.0/mi²). The racial makeup of the city was 90.75% White, 3.76% African American, 0.16% Native American, 1.99% Asian, 0.04% Pacific Islander, 1.39% from other races, and 1.90% from two or more races. 8.51% of the population were Hispanic or Latino of any race. There were 31,848 households out of which 24.1% had children under the age of 18 living with them, 53.1% were married couples living together, 7.1% had a female householder with no husband present, and 37.2% were non-families. 29.5% of all households were made up of individuals and 11.6% had someone living alone who was 65 years of age or older. The average household size was 2.26 and the average family size was 2.81. In the city the population was spread out with 18.9% under the age of 18, 8.1% from 18 to 24, 26.4% from 25 to 44, 26.7% from 45 to 64, and 19.8% who were 65 years of age or older. The median age was 43 years. For every 100 females there were 95.1 males. For every 100 females age 18 and over, there were 92.8 males. The median income for a household in the city was $60,248, and the median income for a family was $77,861. Males had a median income of $52,287 versus $33,347 for females. The per capita income for the city was $45,628. 6.7% of the population and 4.1% of families were below the poverty line. 6.0% of those under the age of 18 and 4.9% of those 65 and older were living below the poverty line. Boca Raton and its neighboring communities in south Palm Beach County have drawn a very large number of Modern Orthodox Jews who have established a network of synagogues and yeshivas. Many Jewish residents of this community tend to be involved with numerous Religious Zionist causes and express strong support for Israel. Listed on early maps as "Boca Ratones," many people wrongly assume the name is simply translated to "Rat’s Mouth." The Spanish word boca (or mouth) was often used to describe an inlet, while raton (literally mouse) was used as a term for a cowardly thief. But the “Thieves Inlet,” Boca Ratones, originally appeared on eighteenth century maps associated with an inlet in the Biscayne Bay area of Miami. By the beginning of the nineteenth century, the term was mistakenly moved north on most maps and applied to Lake Boca Raton, whose inlet was closed at the time. The Spanish language pronunciation has been retained by locals; "Boca Raton" rhymes with "tone" and "alone" (not with "baton"). The Boca Raton Resort & Club Tower. The city's early history was as the site of Addison Mizner's Boca Raton Hotel, its most prominent building. The "pink hotel" today is visible from miles away as a towering building on the Intracoastal Waterway. The Pearl City neighborhood of Boca Raton was established to originally house the service personnel for the hotel. Japanese farmers of the Yamato Colony converted the land west of the city into pineapple plantations beginning in 1904. During World War II much of their land was confiscated and used as the site of a major training facility for B-29 bomber crews. Much of the airbase was later donated to become the grounds of Florida Atlantic University, many of whose parking lots are former runways of the airbase, while part of the airbase is now used as Boca Raton Airport. The Japanese heritage of the Yamato Colony survives in the name of Yamato Road (NW 51st Street) just north of the airport and at the Morikami Museum and Japanese Gardens northwest of the city. Boca Raton was the site of two now vanished amusement parks, the Africa U.S.A. park (1953-1961) and Ancient America (1953-1959). Africa U.S.A. was a wild animal park in which the tourists drove through the park and could view the animals outside their cars. It is now the Camino Gardens subdivision one mile (1.6 km) west of the Boca Raton Hotel. Ancient America was built surrounding a real Calusa Indian burial mound. Today, the mound is still visible within the Boca Marina & Yacht Club neighborhood on U.S. Route 1, just north of Yamato Road. In the late 1960s, Boca Raton became the southern home to International Business Machines. In 1965, well before the extension of I-95 into Southern Florida, IBM purchased several hundred acres of real estate just west of the CSX rail line, just northwest of Florida Atlantic University. Construction of IBM's main complex began in earnest in 1967, and the mammoth manufacturing and office complex was dedicated in March 1970. The campus was designed with self-sufficiency in mind, and to that end sported its own electrical substation, water pumping station, and rail-spur. Among other very noteworthy IT accomplishments, such as the mass manufacture of the System/360 and development of the Series/1 mainframe computers, IBM's main complex was the birthplace of what we know today as the IBM PC, which later evolved into the IBM PS/2. In 1987, IBM relocated their manufacturing for what became the IBM PC Company to Research Triangle Park in Raleigh, North Carolina, and converted the cavernous manufacturing facilities into offices and laboratories, later producing ground-breaking products such as the OS/2 operating system and VoiceType Dictation, known today as ViaVoice voice-recognition software. T-REX Corporate Center was originally one of IBM's research labs where the IBM PC was created. IBM maintained its facilities at Boca Raton until 1996, when the facility was closed and was sold to Blue Lake Real Estate, who in turn sold it to the T-REX Management Consortium. Today, T-REX has revitalized the facility and its surrounding real estate into a highly-successful and beautifully landscaped business/research park. What used to be IBM's Building 051, a highly robust, secure, and secretive complex, separated from the former main IBM campus by Spanish River Boulevard was donated to the Palm Beach County School District and converted into Don Estridge High-Tech Middle School. It is named for the late Don Estridge, whose brilliant team was responsible for giving the world the first IBM PC. Due to Boca Raton's population explosion, many areas began to decay, including the downtown area. During the crisis, the only places that were popular were the Bank and Trust Tower (now the Bank of America Tower) and Royal Palm Plaza (now Royal Palm Place). The Boca Raton Mall, a popular icon of shopping in the 1970's was going vaccant, due to the opening of Town Center at Boca Raton in 1979. Many buildings were also being boarded up from the lack of customers and high traffic from cars going to the beach. However, in the late 1980s, the city came up with a master plan to revitalize the decaying area that included mass landscaping, expansion of the downtown park, Sanborn Square, restoration of the old city hall to become a museum (The city council completely moved out in the late 80s), and a large outdoor mall to replace the dead Boca Raton one! To do this, Boca Raton then passed a city ordinance banning the further development of multi-family housing within the city limits and for special zoning that limits the size and types of commercial buildings and advertisement signs which may be erected within the city limits. There are no traditional car dealerships in Boca Raton because of these limits on roadside use, but a luxury car dealer did showcase a few cars inside a roadside building having glass walls. Corporations such as McDonald's had to redesign their classic "golden arches" restaurant to conform to Boca Raton's sign zoning restrictions. The unincorparated part of Boca Raton still feature the classic arches, but the heights of the signs were reduced. The effects can be seen in the city in which a number of buildings were constructed with classic Addison Mizner architecture and in the subdued roadside advertising. Mizner Park is a downtown attraction in Boca Raton's thriving financial district. 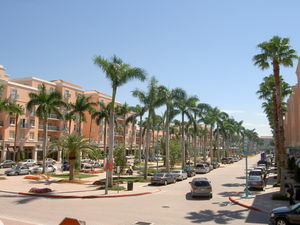 In 1991, a the new downtown shopping center, Mizner Park, was completed over the site of the Boca Raton Mall. It has since become a cultural center for the city. Featuring a landscaped central park between two cobblestone roads (collectively called Plaza Real) with stores only on the outside of the roads, Mizner Park resembles a Mediterranean suburb with a more contemporary look. It features many fine restaurants and is home to the Boca Raton Museum of Art. In 2002, a new amphitheater was built replacing a smaller one, providing a large-capacity outdoor venue. However, despite Mizner Park's success, crime and racism occurred. In the mid 1990s, the Ku Klux Klan marched down Plaza Real; there were also several shootings, stick-ups, and a minor crime causing fountain damage from liquid soap. It was fixed many months after and was eased from Hurricane Frances washing it away. The faux bell tower was however severly damaged. These harsh crimes and natural problems didn't stop the downtown remodeling project. Six new high-rise buildings were built downtown. The historical Bank of America building built in the 1960s was renovated and Charles Schwab moved in on the east side. It is the only building above the height limit that is allowed to be and is a symbol of Boca Raton's skyline. In the early 21st century, Simon Malls bought out Town Center at Boca Raton and rebuilt the mall with an extension. Originally, it was feeling doomed since Mervyn's closed its store as well as another in the city. Saks Fifth Avenue then took and renovated the space and the old Saks was demolished and the lot was extended with a new anchor Nordstrom. The finished product was unveiled in late 2000 with over 25 new stores to shop in. It has now become a tourist attraction and one of the largest Simon malls in South Florida. Other projects, such as the renovation and expansion of Boca Raton's YMCA facility will expand the incorporated area's limits. Public education is provided and managed by The School District of Palm Beach County. Boca Raton is also home to several notable private and religious schools. The city and its unincorporated sections are served by four public high schools. Within the city limits, Boca Raton Community High School serves the eastern part of the city. Spanish River Community High School serves the western part of the city and parts of unincorporated Boca Raton. Olympic Heights Community High School serves the west-central unincorporated parts of the city. Finally, West Boca Raton Community High School serves the far west unincorporated sections of Boca Raton. The four high schools also draw some students from parts of Delray Beach and other parts of Palm Beach county through magnet programs. The original IBM PC now resides at Don Estridge High Tech Middle School, only a few blocks away from T-REX Corporate Center, its birthplace. The area is served by five middle schools. Don Estridge High Tech Middle School is a technology magnet school that is named for Don Estridge, the leader of a small group of engineers who developed the IBM Personal Computer in Boca Raton. It was in Boca Raton where the Episcopal School Foundation chartered the prestigious preparatory school, Saint Andrew's School in 1961. The Rev. Hunter Wyatt-Brown, Jr. (Headmaster from 1962-63) and Eugene Curtis, Jr. (Headmaster from 1964-71) led the effort to secure the land and funds necessary to build the school. Many in the community came forward to support the project, most notably Lucy and Alexander Henderson, who gave the majority of the funds needed to start the school. Pine Crest School, based in Ft. Lauderdale, has a campus in Boca Raton. Pope John Paul II Regional High School provides traditional Catholic schooling. 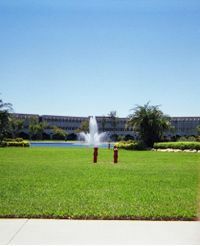 Palm Beach Community College has had a Boca Raton campus, adjacent to Florida Atlantic University, since 1971. Florida Atlantic University, founded in 1961, held its first classes in Boca Raton in 1964. FAU is a member of the State University System of Florida. Lynn University (originally founded as Marymount College, then re-named The College of Boca Raton in 1974, and finally Lynn University in 1991) is a four year co-educational institution re-named to honor the Lynn (Eugene & Christine) family who continue to be generous benefactors of the university. The Boca Raton Public Library and South-Western County Regional Library serve Boca Raton. A second municipal library is being built on Spanish River Boulevard west of I-95. Many residents of Boca Raton are well known around the world including Chris Evert (tennis player), Daniel Keyes (writer), Andy Mill (skier), Morgan Pressel (golfer), Andy Roddick (tennis player), Vince Spadea (tennis player), Bernhard Langer (golfer),Cris Carter (ex-football player) and Jill & Herb Levitt,Realtors/Relocation Specialists (The Professional Team). Boca Raton was the site of the first anthrax attack in the United States when two employees at the American Media building were exposed to the agent. Robert "Bob" Stevens, photo editor of the Sun, a supermarket tabloid published by American Media, died of inhalation anthrax while Ernesto Blanco, a 73-year old mail room employee, recovered. American Media relocated their offices. The American Media building was sealed until the summer of 2004, when it became the last building in the United States to be decontaminated of anthrax spores using chlorine dioxide gas. See Timeline of the 2001 anthrax attacks in Florida. American Media has moved their HQ to New York City. According to MessageLabs, (an email security vendor), Boca Raton is the "spam capital of the world", being the source of a surprisingly high fraction of all spam generated worldwide. According to the Miami Herald, the town has a long history of involvement in confidence tricks. Richard C. Breeden, former U.S. Securities and Exchange Commission chairman, once called the town "the only coastal town in Florida where there are more sharks on land than in the water." In the keynote address to a computer security conference on 8 June 2004, Bruce Sterling described the town as the "Capone-Chicago of cyber fraud." According to a number of US Federal indictments, as of June, 2004, the Gambino family continues to operate in Boca Raton. Air: The Boca Raton Airport is a general aviation airport located immediately adjacent to Florida Atlantic University and Interstate-95. It has a control tower which is manned from 0700 to 2300. The Boca Raton Airport is publicly-owned and governed by a seven member Authority appointed by the City of Boca Raton and the Palm Beach County Commission. Palm Beach International Airport (PBI) is located to the north in West Palm Beach while Fort Lauderdale-Hollywood International Airport (FLL) is located to the south in Fort Lauderdale. Highways: US Highway 1 passes through the city’s downtown, commercial, and industrial districts. US Highway 441 passes through the city's unincorporated area's other commericial districts and agricultural areas. Interstate 95 bisects the city from north to south with four interchanges serving Boca Raton. Florida's Turnpike passes through the city's unincorporated areas with one interchange at Glades Road (State Highway No. 808). Rail: The Tri-Rail commuter rail system serves the city with its Boca Raton Station located on the south side of Yamato Road just west of I-95. CSX Transportation and the Florida East Coast Railway also serve the city. On Monday, 24 October 2005, Hurricane Wilma struck Boca Raton with winds in excess of 100 mph. While Wilma was still over the Caribbean, it achieved the lowest central pressure of any Atlantic hurricane at 882 millibars, surpassing Hurricane Gilbert's low of 888 mb in 1988, thus making Wilma the most intense Atlantic hurricane on record. Wilma produced well over 60 inches of rainfall as it moved across the Yucatan Peninsula, then turned northeastward and made its Florida landfall south of Naples as a Category 3 storm. Throughout the city, damage was widespread. The Boca Raton Airport suffered significant damage, including the collapse of two hangars, several planes flipped over, and hangar doors blown in. The airport has reported $12 million in damage in the aftermath of Wilma, according to information from the South Florida Sun-Sentinel. This page was last modified 23:30, 12 April 2006.